This June we will be featuring the work of collaborative sculptors, Robin & John Gumaelius and painter, Robert Schlegel. John & Robin Gumaelius create ceramic and mixed media assemblage sculptures which stretch the bounds of imaginative figures, embracing the theatrical and whimsical. Robert Schlegel combines strong lines and structure, with bold color in his paintings which often include dwellings and birds. 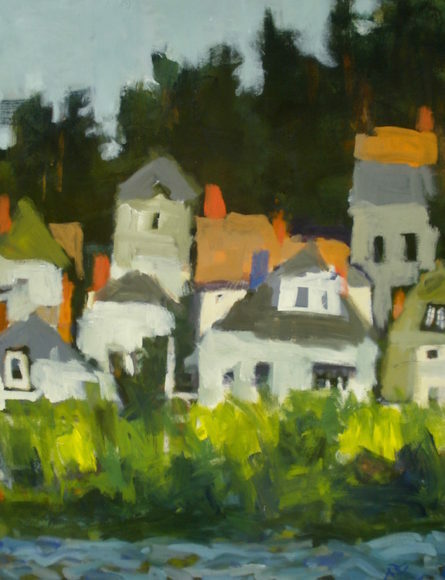 Join us for an artist reception on First Friday, June 2nd 5-8 p.m. Show runs June 1st- July 4th. 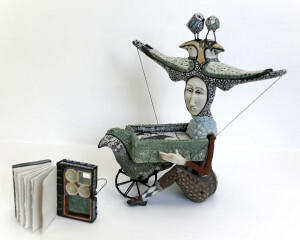 Robin and John Gumaelius, collaborating artists and husband and wife, create animated human and birdlike sculptures. They combine ceramic, steel and wood as they form highly inventive sculptures that are often comical or bizarre. Bob Schlegel creates images that possess tension between the representational and the abstract. He paints in the studio and plein aire from preliminary sketches in charcoal, pencil and oil pastel and takes reference photographs as necessary. Drawing is the foundation for his work, he is tenacious with the sketch whether it be life-drawing session or in the field. Through line, contrast, texture, color and composition he explores form and shape where things in the natural world and things that are made by man collide.